Prepare pudding according to package directions. Place a thin layer of graham cracker crumbs in the bottom of three parfait cups or small bowls and cover with a thin layer of berries then a layer of pudding. Complete parfaits by layering graham crackers, pudding, and berries until all ingredients are used. Garnish with coconut and chill for one hour before serving. Note: This dessert freezes well. For variation, use sliced bananas and peaches in addition to berries, or try fruit-flavored soy yogurt in place of pudding. 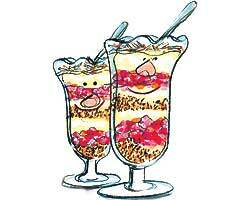 Serving size: 1 parfait (3/4 cup). Exchanges per serving: 2 starch, 1 fruit, 1 low-fat milk, 1 fat. Carbohydrate choices: 4 1/2. This recipe was developed by Nancy Berkoff, a registered dietitian and certified chef who writes and teaches about food in Long Beach, California.